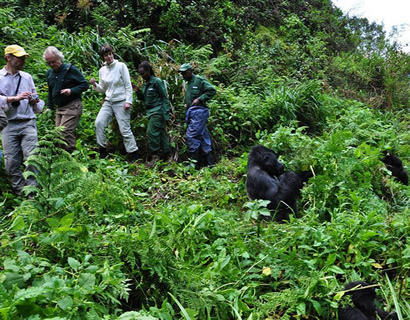 Where to Go Gorilla Trekking - Rwanda or Uganda? There are roughly 1000 mountain gorillas remaining in the world only found in Bwindi Impenetrable forest national and the Virunga Conservation area shared by Uganda, Rwanda and Democratic Republic of Congo. At present gorilla safaris to Congo are closed due to insecurity related issues associated with kidnap of travelers and killing of park rangers. This means that tourists going for gorilla safaris to meet face to face with the critically endangered species find their way to Bwindi impenetrable national park in Uganda or volcanoes national park in Rwanda. Some tourists have however tracked gorillas in the two national parks and often find themselves comparing to see in which national park they have a better experience and value for their money. In this case, we make a comparison of Bwindi impenetrable national park and volcanoes national park basing on the tourist pre-tracking experience, distance and accessibility of the national park, gorilla experience and the people around the two national parks, the accommodation facilities and price of gorilla permits. Volcanoes national park can be accessed easily and quickly because Rwanda is a small country and it only takes a 3 hours drive from the airport to reach the national park. In Bwindi it’s a very different story. The park is over 600kms from the city center and would take a 9 or 10 hours drive to get there. However, there are flight operations between Entebbe international airport and Kajjansi airfields to kihihi and Ishasha airstrips in kanungu district. Tourists can then be transferred from here to Bwindi. A flight ticket may cost around $260 with Aero link Uganda. In Rwanda, the pre-tracking experience is a bit limited because it would only take a 3 hours drive to volcanoes national park. This is very convenient for tourists interested in spending shorter time in east Africa. In volcanoes tourists have high chances of tracking gorillas the same day of their arrival without getting too exhausted. While in Uganda a tourist will get a great pre-tracking experience mainly because Bwindi impenetrable national park is located in southwestern Uganda several kilometers from the city center (between 550-600km on road a 9 or 10 hours drive) depending on the route used. This gives a tourist a chance to view various attraction en-routes, stopovers at the equator for photographs, interaction with the highly hospitable Ugandans, and visit other national parks for game viewing especially Kibale forest national park, Queen Elizabeth national park and Lake Mburo national park. This however is best for tourists on long holiday vacations and those interested in viewing Uganda’s wild animals. However, the introduction of Rwanda Uganda gorilla tours has made it easy to trek gorillas in Uganda starting from Kigali. Here travelers fly in to Kigali international airport and then cross through Cyanika border in kisoro or Katuna border in Kabale depending on which section of Bwindi they are trekking in. A drive from Rwanda to Uganda lasts for roughly 4 hours which require travelers to setoff from kigali at 3am to catch up with the pre trekking briefing in Uganda at 7:00am. Gorilla permits in Uganda are relatively cheaper compared to Rwanda. Uganda sells gorilla permits at $600 for foreign residents, $500 for foreign residents and 250,000shs for East African residents. On the other a single Rwanda gorilla permit costs $1500 for all travelers irrespective of one’s nationality. Budget tourists are therefore likely to track gorillas in Uganda and save the $900 for other expenses. However despite the high Rwanda permit costs, travelers are served with a cup of tea during the pre trekking briefing and also get entertained by local traditional dances which is not a case in Uganda. Uganda currently has 15 habituated gorilla groups available for trekking while two gorilla families are undergoing habituation. 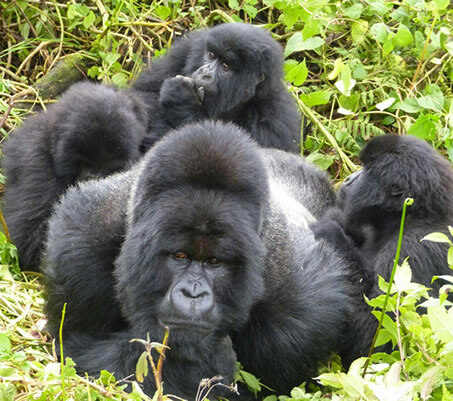 Rwanda on the other hand has 10 gorilla families available for trekking everyday. Therefore, the availability of many gorilla families in Uganda guarantee travelers availability of gorilla permits even for those who book in the last minute. Around Bwindi impenetrable national park, there are many accommodation facilities for example cloud lodges, gorilla forest camp, mahogany springs, Buhoma lodge, Bwindi volcano lodge and many others which all offer luxury services. A tourist here can easily choose and go the accommodation facility of his/her choice. In Rwanda there are also good accommodation facilities for example, Sabyinyo silverback lodge, Virunga lodge, Gorilla Mountain View but most tourists prefer staying in Virunga lodges. Bwindi impenetrable national park is surrounded by the Batwa pygmies as well as the Bakiga. These have unique cultures which acts as tourist’s attractions themselves especially the Batwa community. A tourist visiting them can engage in activities like the Batwa trail, community walks, forest walks, get entertained by traditional dances and performances. Volcanoes national park also has locals around but however they may not give a fascinating experience to the tourist like the Batwa community in Bwindi impenetrable national park. In Conclusion, both Uganda and Rwanda offer fantastic gorilla tours which a traveler should not miss as each experience is quite different and the terrain is different too. This choice however depends a lot on his/her income, time and desire to visit other attractions. Both Bwindi impenetrable national park and volcanoes national park are interesting and unique in their own ways and therefore different individuals can have different satisfaction levels on their experiences and value for money. For a fair comparison, its better for tourists to visit the two national parks after all they are near each other and it’s even very easy to cross the border from Uganda to Rwanda or from Rwanda to Uganda as long as you have proper travel documents.